This article is about the old complex of buildings destroyed during the September 11 Attacks of 2001. For the new complex built on the same site, see World Trade Center (2001–present). The original World Trade Center (WTC) was a complex of buildings in Lower Manhattan, New York, New York, United States which was destroyed in the September 11, 2001 attacks; a new complex is mostly complete and is built on the site of the old one. 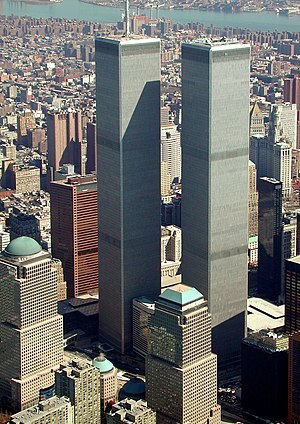 The biggest buildings in the original World Trade Center were the Twin Towers. The North Tower was the tallest building in the world when it was built. Taller ones were built later. The Twin Towers had 110 stories, and, at the time of its destruction, were the two tallest in New York. They and 7 World Trade Center were destroyed in the September 11, 2001 attacks and other buildings were damaged beyond repair. The original World Trade Center was designed by Minoru Yamasaki in the early 1960s using a tube-frame structural design for the twin 110-story towers. In gaining approval for the project, the Port Authority of New York and New Jersey agreed to take over the Hudson & Manhattan Railroad which became the Port Authority Trans-Hudson (PATH). Groundbreaking for the World Trade Center took place on August 5, 1966. The North Tower, officially World Trade Center 1 was completed in December 1970 and the South Tower, officially World Trade Center 2 was finished in July 1971. Construction of the World Trade Center involved excavating a large amount of material that was then used in making Battery Park City on the west side of Lower Manhattan. The first terrorist attack on the World Trade Center occurred on February 26, 1993, at 12:17 PM. A truck filled with 680 kg of explosives, planted by Ramzi Yousef, exploded in the underground garage of the 1 WTC. The bombing created a 30 m (100 ft) hole through five sublevels. Six people were killed and 1,042 others were injured during escape attempts. Many people inside the tower were forced to walk down darkened stairwells with no emergency lighting, some taking two hours or more to reach safety. As a memorial to the victims of the bombing of the tower, a reflecting pool was installed with the names of those who were killed. United Airlines Flight 175 crashes into the south tower, with the north tower already burning. On September 11, 2001, Al-Qaeda terrorists hijacked American Airlines Flight 11 and crashed it into the 1 WTC, striking between the 93rd and 99th floors, killing 1,344 people. Seventeen minutes later, a second group crashed the hijacked United Airlines Flight 175 into the WTC, striking between the 77th and 85th floors, fewer than 700 were killed. At 5:20 p.m., 7 World Trade Center started to collapse with the crumble of the east penthouse. The Vista Hotel was destroyed during the collapse of the twin towers. The three remaining buildings in the WTC plaza were damaged by debris and later were demolished. Many conspiracy theories have appeared which say that certain people in the United States government knew about the attacks beforehand, or even made them happen. The National September 11 Memorial & Museum. The reflecting pools are on the site of the Twin Towers. The National September 11 Memorial & Museum (also known as the 9/11 Memorial & Museum) is a memorial and museum in World Trade Center site, as the memorial of the 9/11 attacks, which killed 2,977 people, and the 1993 bombing, which killed six. It is operated by a non-profit institution whose mission is to raise funds for, program, and operate the memorial and museum at the World Trade Center site. The National September 11 Memorial opened on September 11, 2011, and the museum opened in May 2014. ↑ "History of the Twin Towers". Port Authority of New York and New Jersey. June 1, 2014. Archived from the original on December 28, 2013. Retrieved August 17, 2015. Nicol Prism - The new version of the twin towers, WTC members of the architectural complex, is inaugurated on 1 May 2012 without much fanfare. This page was last changed on 12 March 2019, at 17:25.